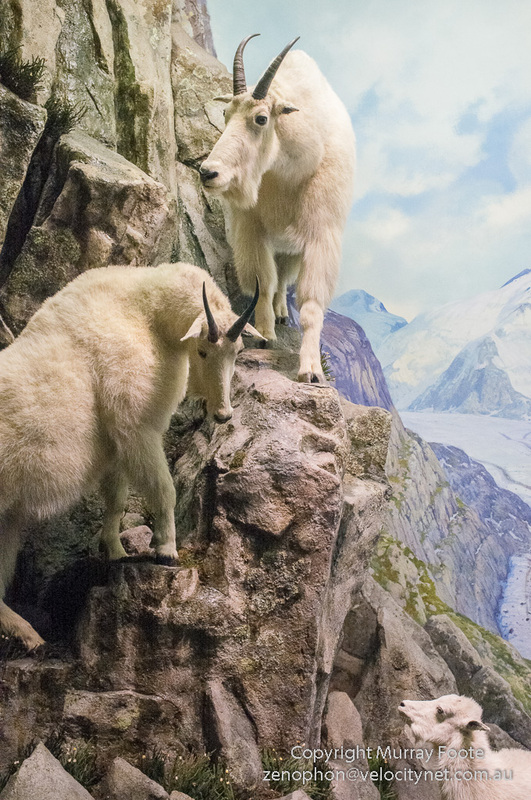 … and these are Mountain Goats. 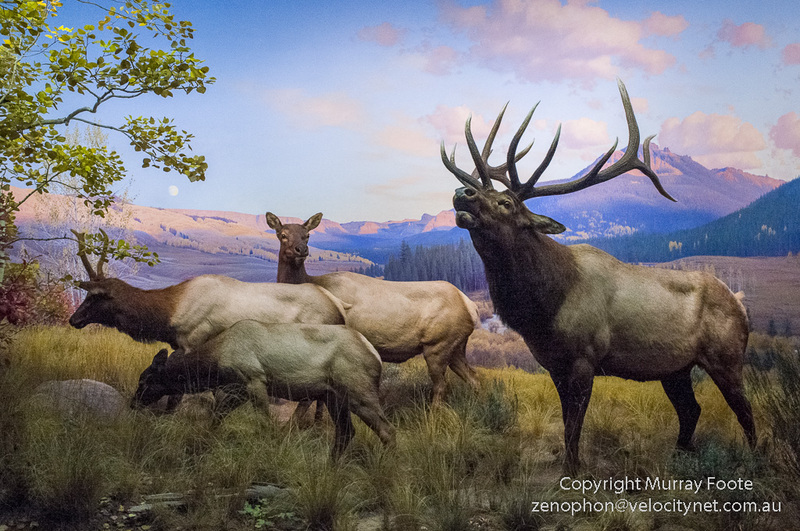 Just a couple of the many large three-dimensional dioramas, quite impressive in themselves though with a slightly archaic nineteenth century ethos to them. 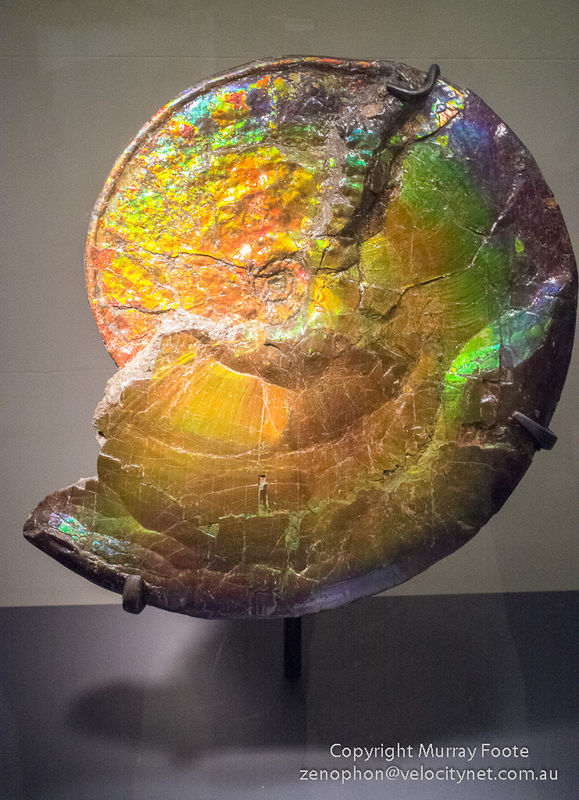 This is an opalised ammonite shell from Alberta (inland western Canada). It is from 65 million years ago, when the dinosaurs were about to evaporate and Alberta was under the sea. 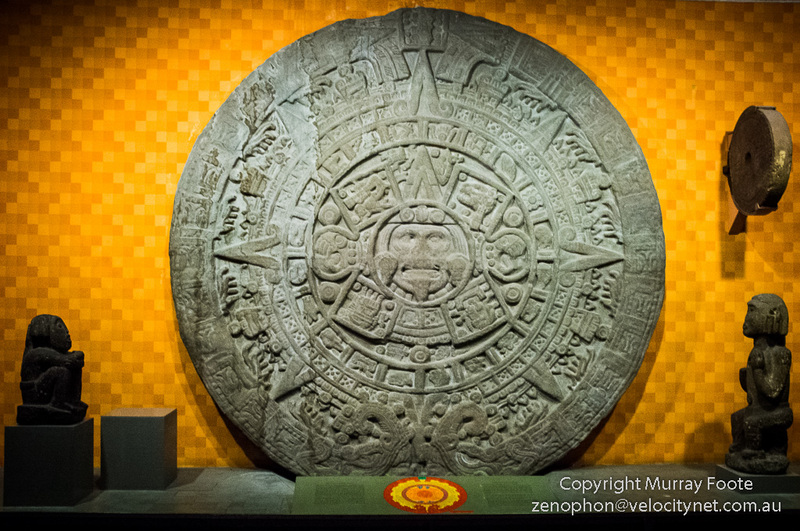 This is a full scale replica of the Aztec Stone of the Sun. It is twelve feet in circumference and the original weighs over twenty tons. In the centre is the sun god Tonatiuh. 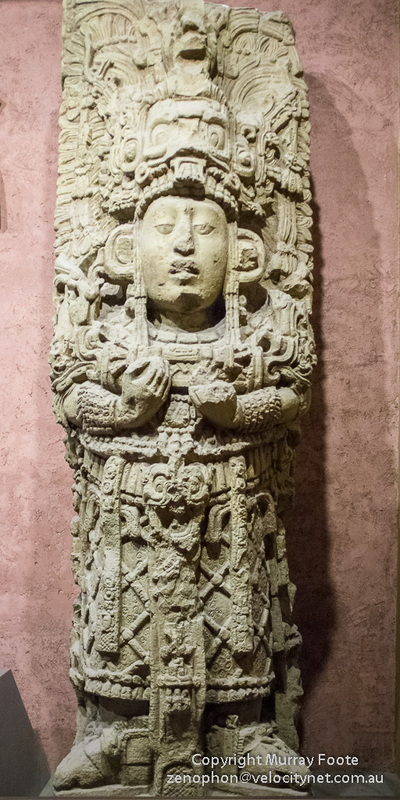 A Mayan sculptural facade from the “nunnery” quadrangal at Uxmal in the Yucatan. Removed in 1840. 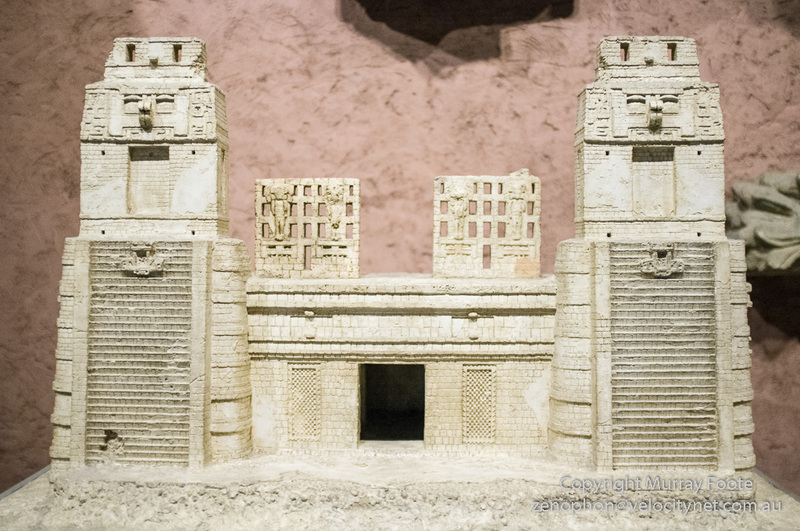 A model of The Castillo at Chichen Itza, in cutaway style to show an earlier building buried within, in a Mayan equivalent of Russian dolls. 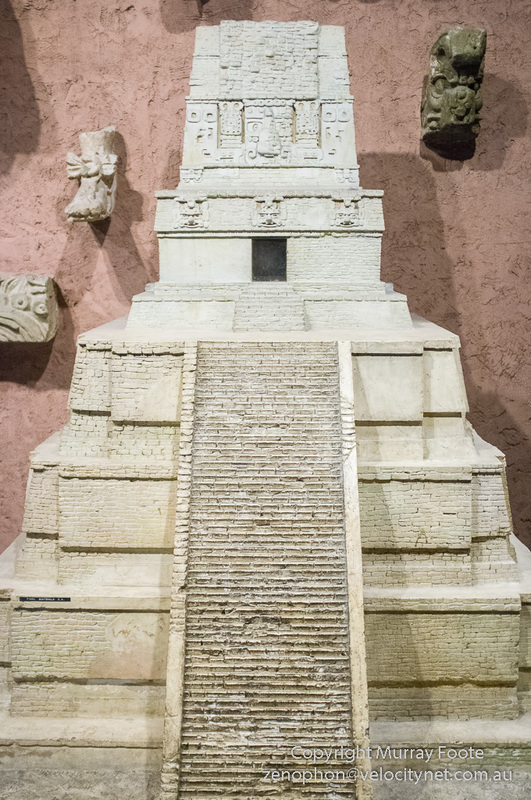 A model of Temple IV at Tikal. The original is the highest of all Mayan buildings at 212 feet. 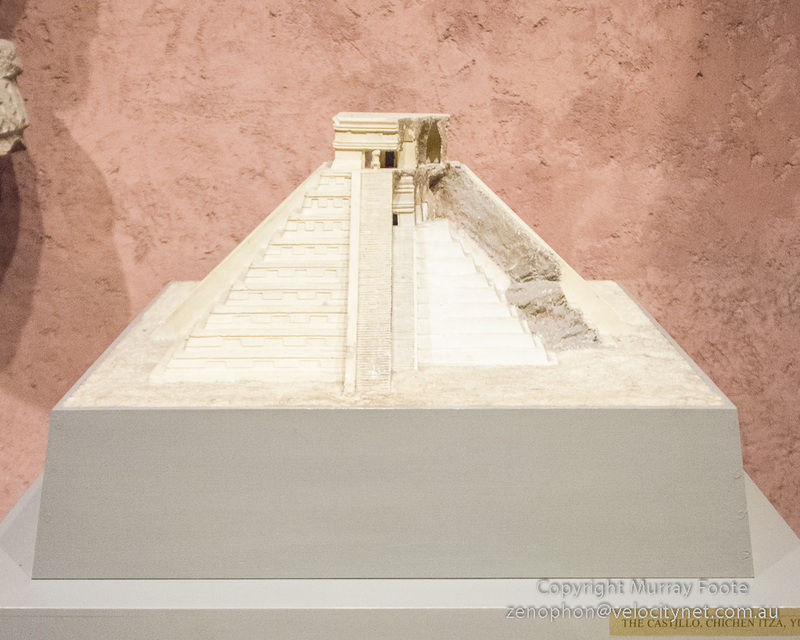 A model of another Mayan building. This might be the Red House at Chichen Itza, I’m not sure. An American Indian headdress from the Amazon. From the Les Paul Trio and the Iridium it was only a few metres to Times Square. By now it was after midnight and since it was Halloween there were lots of people in strange costumes and much posing for photographs. A little later, we were down in the metro, waiting for a train. A train turned up and most of the people climbed on. The sax playing busker turns towards me in a moment of recognition. The train is pulling away. Another train is at the platform and the crowd has thinned out. The sax player holds the attention of the few remaining people. … and a bit further down the platform, people wait for the next train. 1 November 2011 (early morning). We had intended to turn up to see Duke Robillard but accidentally turned up to a Jazz band. Duke Robillard was the next night. Fortunately, they were very good indeed. As well as that, the audience was quite small and we were able to sit very close to the band. Les Paul invented the solid bodied electric guitar which was eventually commercialised as the Gibson Les Paul. He also invented overdubbing (multi-track recording) and a number of techniques that later became influential in Blues and rock. Les Paul was primarily a Jazz musician. For many years he played every Monday night at the Iridium Club up until his death in 2009. There are obviously more than three people here but I think it includes two of the trio who played with Les Paul. Initially we decided to visit La Liberté éclairant le monde (or the Statue of Liberty as it’s more generally known) but then we saw the queue. We’re near the end of it here and it stretches out to the right, then back in the distance to the left and then zigzags through the distant building in the far left. That building is where the ferry leaves and when you eventually get to the Statue you get to stand in a succession of queues again. So we decided to move on. You can see the Statue on the horizon in the distance above the runner’s head and the white shape in front of it is a ferry. So instead we found the National Museum of the American Indian, a branch of the Smithsonian Institute in Washington. This was much more interesting. The building was originally the Alexander Hamilton U.S. Custom House which accounts for the maritime decorations in the main halls. 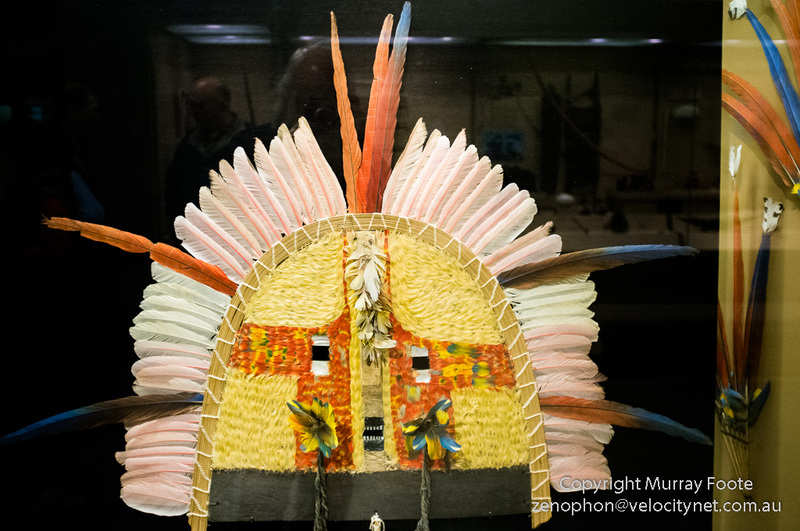 This is a feather headdress or cape of the Mebêngôkre tribe from Brazil. It is quite recent, dating only from 1990. The collection is quite wonderful but I took few photographs, deciding at the time there was no point recording objects that I could do no justice to. I did pick up a useful souvenir, though: a book by Thomas Mann 1491 which offers an eye-opening account of native American societies prior to the arrival of Columbus. We wandered through Lower Manhattan and found a nice café for a bite to eat. On the other side of the island we came out at an historic docklands area. The smaller buildings behind the tall ships are a restored historic area. The restoration doesn’t quite achieve authentic ambience however. There is a curious absence of grime, drunken sailors and brothels. The yellow flag at bottom right (just above the copyright notice) is a water taxi sign. I think the catamaran coming in on the left is the water taxi though I’m not sure where it’s coming from. This of course is a parking meter for gulls with Brooklyn Bridge in the background. And in a clever piece of design flexibility, it doubles as coin-operated binoculars.